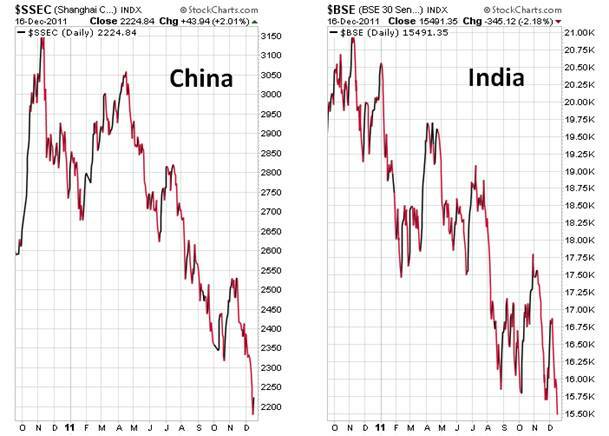 The Chinese and Indian stock markets have dropped over 20% in the last 12 months meeting the common definition of a bear market. As shown in the charts below, last week both of them tumbled further to below their lows of more than two years ago contributing significantly to the recent major sell-off in gold. In fact, elevated risk of housing and credit bubbles in China and India is creating the next financial perfect storm - which does not bode well for gold or silver. The current situation in Asia is very similar to the period just before the 1997 Asian financial storm. Will Asia 2012 = Asia 1997? Gold: About to Run Down to $1,400? In my December 13th article (see here), when gold closed at $1,669.90 the previous day, the charts showed that gold could go down to $1,600 - or even lower - in this correction and that is exactly what happened dropping all the way down to $1,535 before bouncing off its most recent resistance line of $1,562.50 to close out last week at $1,601.30. 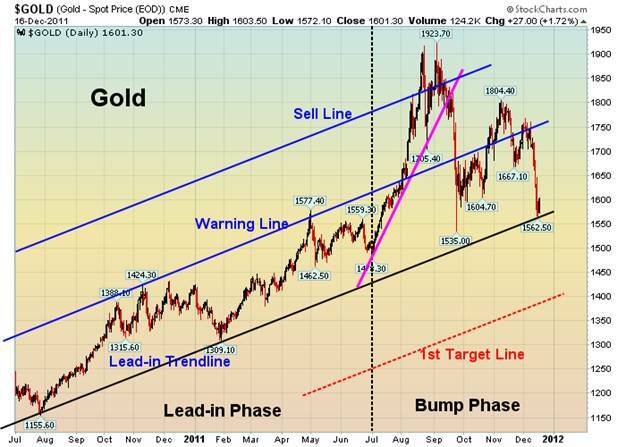 If gold cannot hold above the Lead-in Trend Line of $1,570, gold could step into the "Run" phase of its intermediate-term “Bump-and-Run Reversal Top” pattern with prices in a downhill run to the 1st Target line of $1,400 as shown in the chart below. Silver: Running Down to $24? 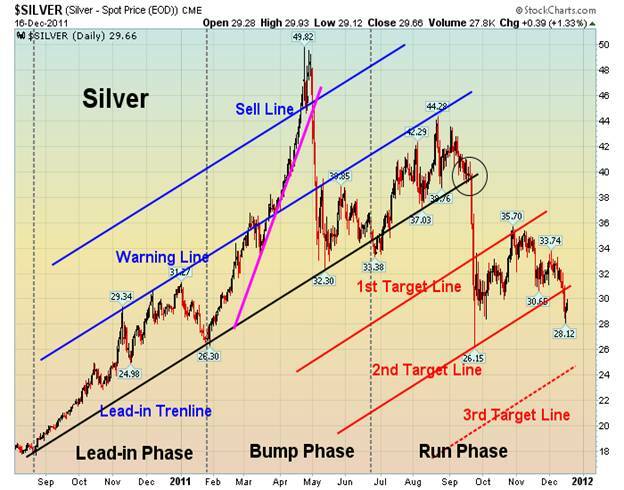 Since my December 13th article (when silver closed out the previous day at $31.38) silver has crashed through the 2nd target line of $31 in the "Run" phase and seen in the chart below and is trending towards a projected downside price target of approximately $24 at the 3rd target line. So there you have it. With the current situations in both China and India keeping their stock markets suppressed and the technical signs of weakness in both gold and silver, their near/intermediate prospects do not appear to be very favorable. As I have said previously, it should prove to be a VERY interesting 2012! Dr. Nu Yu is managing partner and co-founder of Numarkan Investments and an affiliate of the Market Technicians Association. He publishes a Market Weekly Update on gold, silver, the U.S. dollar, the U.S. Treasury bond, and the S&P 500 which can be accessed here . A version of the above article has been posted on Dr. Yu’s site and that of his editor, Lorimer Wilson (www.munKNEE.com and www.FinancialArticleSummariesToday.com). Dr. Yu can be contacted at editor@munknee.com.